SINGAPORE (THE NEW PAPER) - Take up the challenge and prove your love for the bride, say the bridesmaids. And often, the challenges are accepted by the sporting groom and his band of “brothers” — it does not matter how awkward or embarrassing the tests can get. Take the case of the groom and his groomsmen trying to retrieve a gummy worm from a bowl of live worms. The video of the incident went viral and prompted criticism from netizens. How far can such activities get? 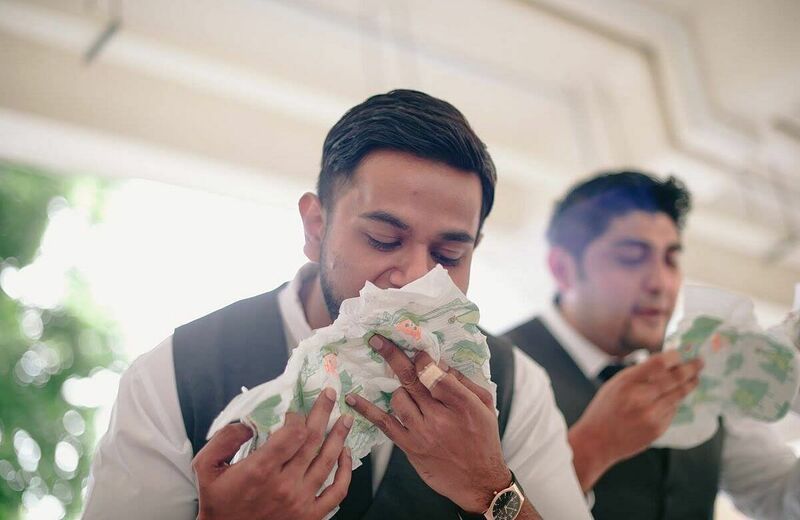 Madam Ayra Quek, 29, recounts how her husband and his nine groomsmen had to eat from a diaper each at their wedding in February. A concoction of Nutella chocolate and condensed milk, which was made to resemble faeces, was smeared on the 10 diapers. Mr Amienuddin Abu Bakar, 29, and his entourage had to bury their faces into the diapers and polish them off. They then lined the diapers which had letters attached to them to spell out “Amien (heart) Ayra”. Madam Quek, a sales executive, says she only learnt of it during the wedding reception. “When I first watched the wedding video during the dinner reception, I kept saying ‘Oh my God’,” she says. She reveals that there was a slight culture shock for the men at first. Of the nine, one is Chinese, another Malay and the rest are Indian. Madam Quek, who is expecting a baby girl next month, adds: “My husband and his groomsmen actually finished all of the things that the bridesmaids made because they did not know that most of the time, people would just dump the food away or play cheat. The men also had to shake off clothespins from their bodies and faces while dancing to music. When Mr Anthony Levi Kho went to pick up his bride, he and his groomsmen were asked to eat balut — boiled, developing bird embryo in the shell. The details remain fresh in his mind even though his wedding was in 2004. Still, the experience was a sweet one for Mr Kho. “I just wanted to show my wife that I love her. It was all for fun. “On top of that, there were videos shot so we can look back at all of these experiences,” he says. In his 16 years as a wedding photographer, Mr Kho says he has seen 80 per cent of grooms go along with the games. But he feels the best way to ensure that everyone has a good time is to make prior checks. “The wife will know the limit best but another way to do it is to check with the elders, because some of the bridesmaids may go on revenge mode and plan games that really cross the line,” he says. He has seen grooms who argue with the bridesmaids during the wedding gatecrash, but he has also seen those who go the extra mile to make their special day even more memorable. Mr Kho says: “I think it depends on the groom. Some do not believe that winning these games will make their wives happy. 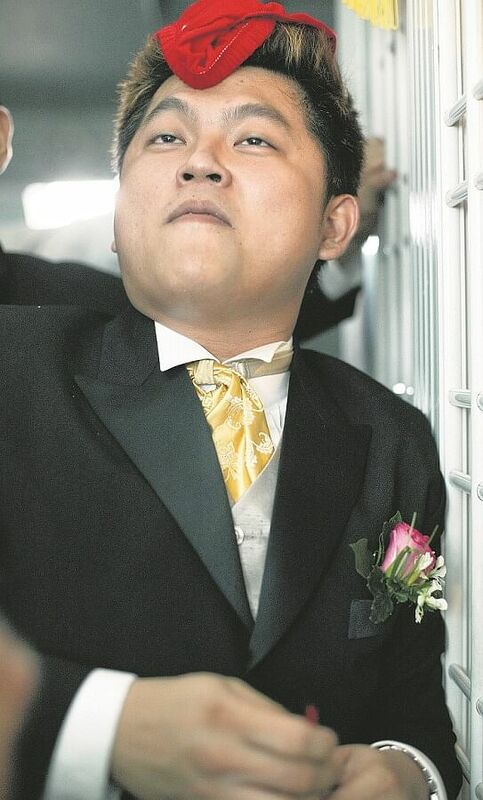 Photographer Kailian Khoo remembers a wedding gatecrash in September. The groom and his band of brothers had to put their hands into three boxes and guess what was inside them. After the wedding, the bride even gave the frogs to her niece to keep as pets. Miss Khoo, 32, the founder of wedding photography agency Trouve, shares another memorable incident. The men had to eat instant noodles, mixed with peanut butter, from plastic potties. She feels “it would not be going too far if both sides, the guys and girls, are okay with it”. Wedding gatecrashing is a tradition for Chinese weddings that has not lost its lustre over the years. Dr Tan Ern Ser, associate professor in the department of sociology at National University of Singapore, says: “The games were created by English-educated, middle-class young people in Singapore. “They were out to make the day a truly memorable one filled with fun and laughter at the expense of the humiliation of the ‘brothers’ by the ‘sisters’ — a kind of power play between the sexes which also provides many photo and video opportunities. “Every wedding reproduces anew this tradition, with each trying to outdo one another with more outrageous or more humiliating games. “I suppose the original intent is to make the groom demonstrate his love and sincerity towards his bride through having to cross a difficult barrier of ‘sisters’ with their often ridiculous requirements. However, some gatecrashes can turn nasty, like some reported cases in China. There, bridesmaids are the ones to “suffer” and it can get so bad — sexual, verbal and even physical abuse —that professional bridesmaids can be hired to take the heat. In Wenchang, a city in the Hainan province, a professional bridesmaid died when she consumed a large amount of alcohol on behalf of the bride and choked on her own vomit in September this year. Dr Tan says: “This tradition can be understood as a manifestation of an older one hijacked and transformed by young people, where previously it was the elders who were in control of the wedding proceedings.